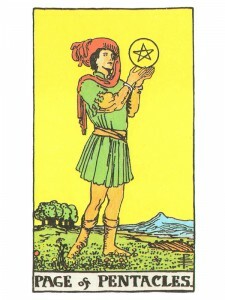 Page of Pentacles suggests mastery of creative power – the ability to enjoy studying. The persevering scholar, the pioneer spirit and the passion to create and give birth to new form or restructure old form. The ability to approach any activity with the quality of fascination and involvement – caring less for the rewards or social position than for the work itself. Experience your own inner child’s playfulness. Do what you loved to do as a child and you will find your genius, your passion and your success. Take the pressure off yourself – enjoy your journey. Do your best and enjoy the “process”. You will be receiving good news – a message that will change many things. There will be a meeting with someone who is kind, generous and sympathetic to your point of view who will create changes for the better through their caring ways. Predictable, physically resourceful, physical means of discovery, good instincts. Communication with earth spirits. Ruled by the drive for transformation. Physically playful and active. Playground of possibility. Physical innocence, purity. Appropriate naivete in others. Transformation side of things physical – new physical opportunities, situations, events and guides. Drive and the forces of change are instinctive, passive as is the growth of a child is automatic. Wonder at physical things – eagerness, enthusiasm, amusement, physical renewal…physical news. Will and desire which are subtle compared to an adults. What new information are you gathering? What new possibilities do you contain within yourself? Who is bringing you financial information? Are you listening to the earth? In the first position: Yours is a world of constant discovery. As adults must allow the child to play (which is the rudiments of learning, i.e., learning how to learn) you must allow yourself to play at life, to enjoy fully the simplest of things. In the second position: You may have discovered the fountain of physical youth or at the very least of renewal. Of course, energy and enthusiasm are invaluable resources, but here, too there seems an endless source of replenishment and in a mine that ever continues to reveal new veins. In the third position: This child is coming to you in person or sending its lessons through other signs in the Physical Plane. Accept with open arms the changes to your physical/material house. Once welcomed there will be productive growth. In the fourth position: Here can be seen the love of the elementals of life, the elfin magic of the woods, the Fantasia of Walt Disney. Here is the simple love of God in nature. Nature itself becomes animated, then personified, then deified. This can also be the love of a child or children. In the fifth position: This Page has your attention, either in person or influence. It has brought renewal and the potential for a whole renaissance of activity, a different phase to your material house. In the sixth position: The Page of Pentacles may be arriving in person in the near future. Person or not, the influence here is to reinvigorate the heart with the utter innocence of youth and its raw potential for physical/material change. The heart slows down but enlarges. Enjoy the obvious, the natural things that are close at hand. In the seventh position: Your mind will be on this page in the near future. You are pulled more and more to nature and her ways as you listen to the spirits of the Earth. The mind is called on to invest in the future by embracing youth principles in the Physical/material Plane. In the eighth position: This child is in your physical house. Change has taken place and things will never be the same again – you must turn your enterprise to the future. In the ninth position: Your heart is on this child. He/she may be the object of your love or the centerpiece of a creative project underway. In the tenth position: Here is the youth, the freshness and purity, the new resources you need for your program in the Physical/material Plane. It may well come in the personage of the Page of Pentacles. It may, however be the access to what he/she represents. What about in the 11th position?